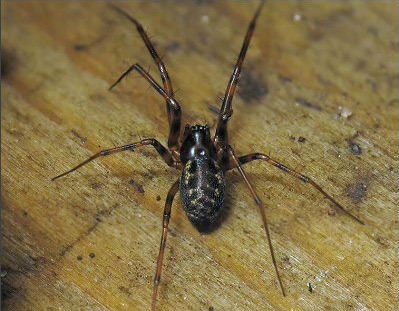 Special features: Despite its specific name 'minutus' is one of the largest money spiders, or which there are around 20 species (though recent taxonomic work suggests the genus should be split into smaller groups). Lepthyphantes minutus is the only one of this genus which has an all-dark carapace and banded legs, making it recognisable in the field. It is widespread and common, sometimes coming into houses, but usually found in dry microhabitats such as the litter caught in epicormic growth on tree trunks, old bird nests etc. 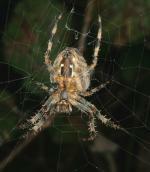 The genus as a whole contains several of our commonest spiders. 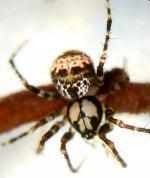 The much smaller Lepthyphantes tenuis which has claim to being THE commonest spider in Britain. Months seen: May to November. Habitat: Tree trunks, old bird nests and sometimes in houses. Builds a small sheet web.